Attendees receive follow up emails listing the exhibitors they visited during the conference and exhibitors are amazed at the response they receive. 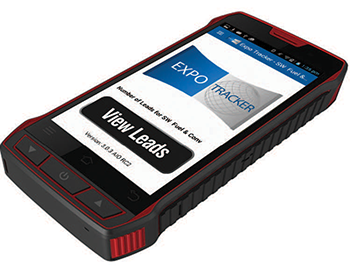 The Expo Tracker Lead Retrieval system takes advantage of the latest mobile technology to provide a cost effective, efficient, and easy to use system with the fastest and most reliable scanning in the industry. The Expo Tracker Android Tablet and Bluetooth 2-D barcode scanner creates a state-of-the-art lead retrieval system that captures every lead, guaranteed, every time! Leads are stored on the Expo Tracker Tablet and synced with our online web portal. Exhibitors can also email themselves, or anyone else, their lead spreadsheet directly from the ET application at any time during the show. Expo Tracker's online ordering and onsite systems create a seamless, hassle-free experience for exhibitors and sponsors. Our professional staff is available onsite for support and assistance during all setup and show hours. Show Management has access to detailed show activity reports. Please visit www.etleads.com to place your order today.